The Ohio Guaranteed Transfer Pathways enable students to streamline credit transfer among the state's public institutions of higher education to find the best pathways to degree completion and launch successful careers. Ohio research universities have a wealth of academic, laboratory and other resources available to businesses across Ohio and the globe. The Ohio Innovation Exchange (OIEx) connects industry to those resources, fostering collaboration and economic development. Staff from the Ohio Department of Higher Education presented to higher education administrators at the State Higher Education Executive Officers Association policy conference in Denver, CO. Click here to download the presentation.. Looking for data and/or reports? 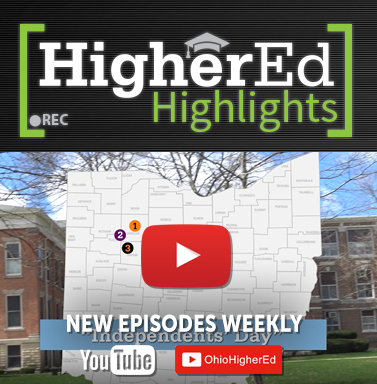 Start your search at our Higher Education Data & Reports page, where you can find statistics and other data related to numerous topics at Ohio's higher education institutions. Through the College Credit Plus program, Ohio students and families have saved more than $416 million on college tuition. Find out more. The Changing Campus Culture initiative seeks to strengthen Ohio's ability to better respond to, and ultimately prevent, sexual assault on the state’s college campuses. Download and read the full report and recommendations (PDF) at this link. Opioid drug abuse has become a crisis in Ohio and across the nation. Start Talking! is an innovative program that aims to give parents, guardians, educators and community leaders the tools to start the conversation with Ohio’s youth about the importance of living healthy, drug-free lives. The GIVE back. GO forward. initiative lets volunteers age 60 and older earn free college tuition. The Ohio Department of Higher Education/Department of Aging pilot program bridges generations while serving youth-centric programs in the Mahoning Valley Find out more!. Ohio legislation requires each state public institution of higher education to provide incoming students with information about mental health topics, including available depression and suicide prevention resources. The Ohio Life Saver website was developed to support Ohio's public colleges and universities in complying with this law. Find out more. Whether you're a high school student exploring careers, a college student searching for an internship, an experienced worker looking for a new job, or a business looking for skilled employees, OhioMeansJobs can help. Ohio Aspire programs provide FREE services for individuals who need assistance acquiring the skills to be successful in post-secondary education and training, and employment. Local programs offer classes at flexible locations, and on different days and times to meet diverse needs. Find out more. 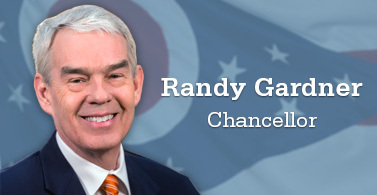 The Ohio Department of Higher Education is a Cabinet-level agency for the Governor of the State of Ohio that oversees higher education for the state. Everything you need to prepare for, search for and pay for college in Ohio. Looking for administrative forms, information on academic programs, or data? Go here first. The Division of Economic Advancement works to retain, attract, and grow Ohio's businesses.